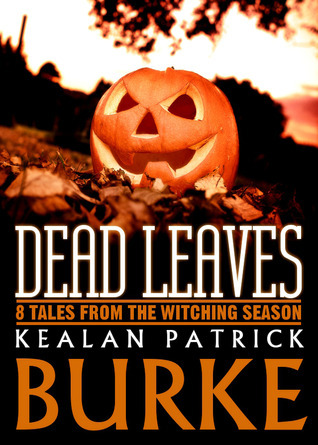 From Bram Stoker Award-winning author Kealan Patrick Burke comes the second in his series of seasonal collections. Featuring seven reprints, a brand new story "The Toll", an introduction, and rounded out by the author's recommended reading and viewing lists, DEAD LEAVES makes for the perfect autumnal read. Halloween is the perfect time of the year to whip out horror books, snuggle on the couch and watch horror flicks, turn on cheesy horror music, and eat too much candy. Kealan Patrick Burke indulges readers with an anthology featuring eight different short stories that may not all cater around Halloween, but which all fit a spooky October mood. Some of the stories are a little similar but they mainly stand on their own. Someone to Carve the Pumpkins is a good opener, although somewhat sad. Great opening for Halloween and that supernatural feel. Haven was twisted and odd, think half the surreal thing flew over my head...How The Night Receives Them spends its time mystifying the reader until it tosses out the twist answer in the end. Tonight The Moon Is Ours is my favorite story - surreal and twisted stuff, I dug the dark fairy tale feel. The Toll, one of the longer offerings, shows what happens to a demented man in a demented situation. In-depth characterization feel. Will You Tell Them I Died Quietly was also lengthy and witch-touched. A lot of people loved this one with it's Lovecraftian tone, but I didn't get into it as much. Not While I'm Around is the weakest stint - not really a story but a cheesy scene that doesn't offer much reading hope. Finally The Tradition ends the anthology with a semi-bang - there's irony and the supernatural involved. Overall some winners mixed in with lukewarm, but still good, supernatural tales. The anthology is clever and imaginatively achieved, so if you're looking for a Halloween themed anthology, this one is worth checking out.